Put a circle of disks on the field with a pprox 15yds diameter.Explain to fwds the circle depicts a clock face.C & D must always be at opposite ends of the clock face. So if C is at 9 o clock then D should be at 3 o&apos;clock etc. As A passes ball to B, C and D make their moves-B passes into either C or D, A joins in to make 3 v2 and breaks out of the circle to shoot against the keeper. 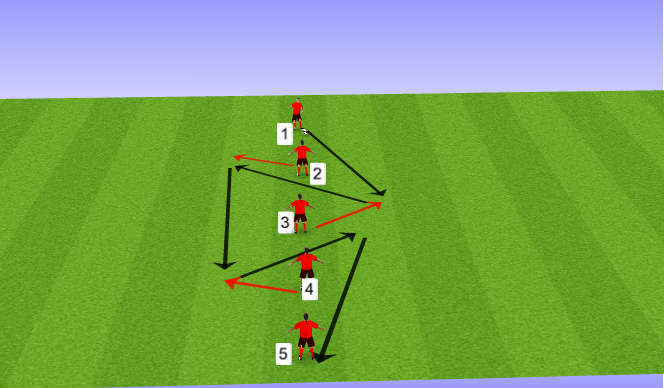 A passes to B.B plays into reds.Reds transfer the ball across area to C who passes ball across to D who passes into a red if the blue wins the ball then they repeat the process. Five minutes and change team in end-zone. If marked run out of your square and into another. The player in your square takes your place. Rotation to receive the ball takes place. 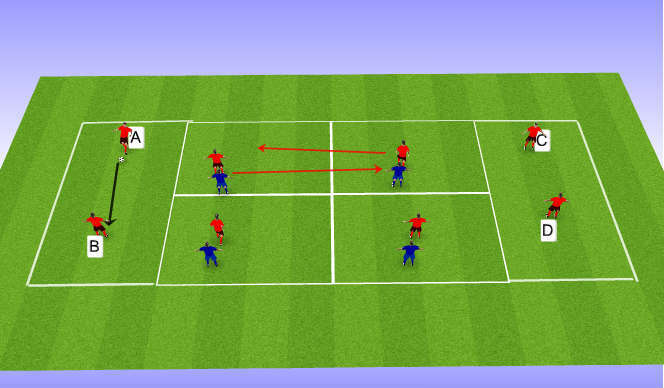 GK throws to Red wide player.He plays into Red 2 and follows into the area ti make a 3 v 3. Progress so that the wide left player joins in to make a 4 v 3.